The original data listed the length of RMS Queen Elizabeth II (294m) under this power of 10, but it is difficult to pass up the opportunity to depict the drama of the Titanic. The very early mock up of this diorama used a long box which suited the landscape orientation of a seascape. However, to be consistent with the other nine in the series, I thought it best to stick to the same dimensions (which does make the setup awkward). This is another mockup. Both the foreground and the background images are of the original photographs of icebergs taken after the disaster, which were suspected of sinking the ocean liner. 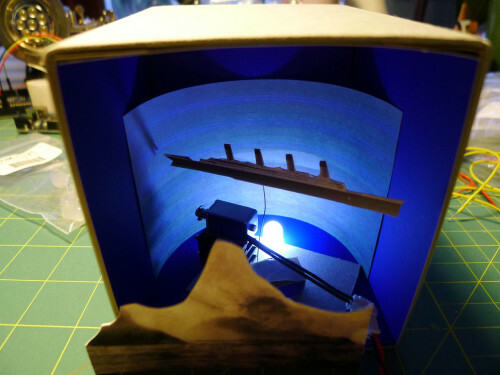 The box casing is cobalt blue, the background will line the back in a curve and the foreground image will obscure the mechanism that rocks the ship. The precise scales still need to be worked out. The scene is lit using a single 10mm diffuse white LED. 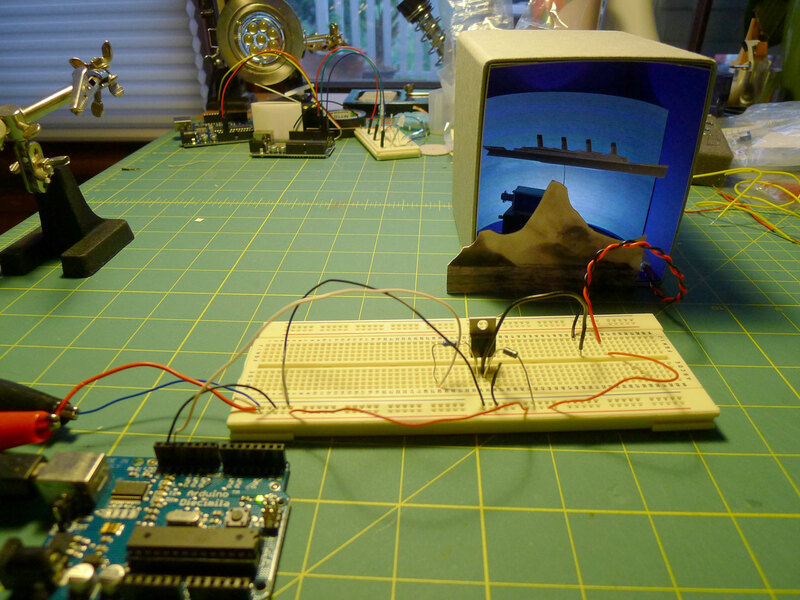 The rocking is carried out by a 5V solenoid (wired to an Arduino) hitting the wire that holds up the ship. Timing and movement with more subtlety are yet to be worked out. I also plan to add a piezo to buzz out the SOS signal in morse code for the radio wave component. The circuit is a little more complicated than all the others so I may need to use a prototype board to solder the components onto it to fit into the box. Then there is also the Arduino. Solenoid draws a large current so it needs a separate power source which will further complicate the wiring. All that plus the Titanic to fit into a box!